Leila Hart Davenport was born in Eureka California May 16, 1931. 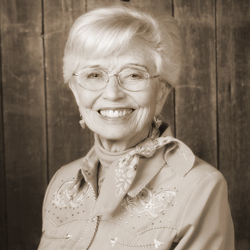 No stranger to rodeos, Leila was a Queen contestant in the Springville Rodeo in 1948 at the age of 17. She was also active in barrel racing. Her parents were Bill and Grace Hart. Her family ran the Silver Fox Farm from 1932-1948. In 1936 they bought property on Harris Road where she still resides. She grew up in a one-room cabin, 12 feet by 24 feet with no electricity. Water had to be carried from a well. In the spring they moved their beds outside for coolness and more room. One of the early settlers of our area, Leila helped her father drive cattle to the high sierra for summer grazing. She remembers chasing bears and singing western songs at the tops of the mountains. Married in 1950, Leila has 4 children and one adoptive daughter. They are Ben, Tom, Jimmy who is deceased, Lisa and Maria. She has 10 grandchildren and 2 great grandchildren. She loved spending time with her family and was active as a domestic engineer (homemaker) for many years. She was District Secretary for Congressman Bob Mathias and retired from being coordinator of the tutorial center at the College of the Sequoias in 1992. Leila is currently active in the Springville Historical Society and often dresses up for museum events at Daunt sharing stories of Springville’s history with visitors. Leila is a member of the Lighthouse Chapel and a treasured member of the Springville Community. Springville Sierra Rodeo is honored to have Leila represent the “Biggest Little Rodeo In The West” as the 2016 Grand Marshal.